Countries around the world are moving towards Universal Health Coverage. Along the way, they face difficult choices. LSE Philosopher Alex Voorhoeve was part of a World Health Organization consultative group offering guidance on how to make these choices fairly. 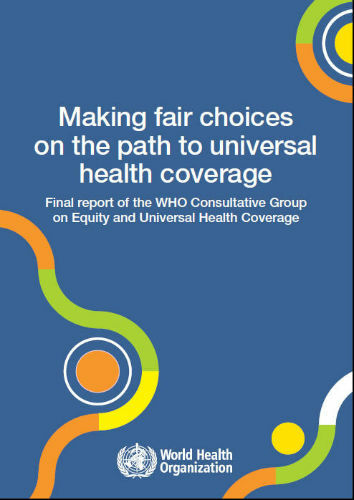 The group’s report, Making fair choices on the path to universal health coverage, was published in May 2014. Further to the report itself, Dr Voorhoeve’s work with the group has led to the following publications. Director-General of the WHO, Dr Margaret Chan, wrote an editorial piece on the report in Health Systems & Reform, Volume 2, Issue 1, 2016. The report was featured in an Editorial in the Bulletin of the World Health Organisation (2014) 92: 389. The report was also Reviewed in Salute Internationale.info, June 18, 2014. Introduction. (Published [journal access required]; pre-typesetting version [access free]) Albert Weale. Précis of Making Fair Choices on the Path to Universal Health Coverage. (Published [journal access required]; pre-typesetting version [access free]). Alex Voorhoeve, Trygve Ottersen and Ole Fritjof Norheim. The Administrator’s Perspective. (Published [journal access required]; pre-typesetting version.) Addis Tamire Woldemariam. Information Will be the Key to Successful Implementation. (Published [journal access required]; pre-typesetting version). Peter Littlejohns and Kalipso Chalkidou. Reasonable Disagreement and the Generally Unacceptable. (Published [journal access required]; (pre-typesetting version). Benedict Rumbold and James Wilson. The Path from Nowhere? (Published [journal access required]; (pre-typesetting version) Albert Weale. Response to Our Critics. (Published [journal access required]; (pre-typesetting version). Alex Voorhoeve, Trygve Ottersen and Ole Fritjof Norheim. Ethical Perspective: Five Unacceptable Trade-offs on the Path to Universal Health Coverage. Ole Frithjof Norheim. International Journal of Health Policy and Management (2015). Three Case Studies in Making Fair Choices on the Path to Universal Health Coverage. Alex Voorhoeve, Tessa TT Edejer, Lydia Kapiriri, Ole F Norheim, James Snowden, Olivier Basenya, Dorjsuren Bayarsaikhan, Ikram Chentaf, Nir Eyal, Amanda Folsom, Rozita Halina Tun Hussein, Cristian Morales, Florian Ostmann, Trygve Ottersen, Phusit Prakongsai, Carla Saenz, Karima Saleh, Angkana Sommanustweechai, Dan Wikler, Afisah Zakariah. Health and Human Rights Journal 18 (2) (2016): 11-22. Universal Health Coverage, Priority Setting and the Human Right to Health. Benedict Rumbold, Rachel Baker, Octavio Ferraz, Sarah Hawkes, Carleigh Krubiner, Peter Littlejohns, Ole Frithjof Norheim, Thomas Pegram, Annette Rid, Sridhar Venkatapuram, Alex Voorhoeve, Daniel Wang, Albert Weale, James Wilson, Alicia Ely Yamin, and Paul Hunt. The Lancet. Making Fair Choices on the Path to Universal Health Coverage: Applying Principles to Difficult Cases. (Copy available on request.) Alex Voorhoeve*, Tessa TT Edejer,* Lydia Kapiriri*, Ole F Norheim*, James Snowden*, Olivier Basenya, Dorjsuren Bayarsaikhan, Ikram Chentaf, Nir Eyal, Amanda Folsom, Rozita Halina Tun Hussein, Cristian Morales, Florian Ostmann, Trygve Ottersen, Phusit Prakongsai, Carla Saenz, Karima Saleh, Angkana Sommanustweechai, Daniel Wikler, Afisah Zakariah (* = lead author). Health Systems and Reform (forthcoming). The report was launched at LSE on 1 May 2014. The launch featured responses from leading academics and the Director-General of the Ethiopian Ministry of Health. Further details. Basis of a “Writeshop” at the Pan-American Health Organisation in Washington, D.C. on May 5-9 2014, with participants from the World Bank, PAHO, WHO, and departments of health from several countries. The purpose was to develop ten illustrative country case studies (forthcoming). Further details. Center for Global Development, Washington D.C., May 6, 2014. Presentation at PAHO with comments by Amanda Glassman, Center for Global Development, May 8, 2014. Webinar via PAHO at May 8, 2014. Further details. You can view this webinar in English and in Spanish. Priorities 2020 meeting in Bergen, May 11-13, 2014. UCL & KCL Social Value Workshop, London, May 23, 2014.
WHO, Geneva, June 12, 2014. Global Summit of National Bioethics Committees, Session on Universal Health Coverage, with comments on the report from National Ethics Committees of Mexico, Sri Lanka, Bolivia, Cuba, Tunisia and Sweden, June 22-23, 2014. Further details. World Congress on Bioethics, Session on the Ethics of Universal Health Coverage, June 24-27. Further details. Chilean Institute of Nutrition, Santiago, Chile, 6 October 2014. National Health Technology Committee, Ministry of Health, Santiago, Chile, November 19 in an event on “Procesos en evaluación de tecnologías sanitarias: desde la evidencia a la recomendación”. Global Health and Population Frontiers Seminar, December 9, 2014, Harvard University. Further details. Medsin Conference: Global Health: The Bottom Line, March 8, 2015, London. Coverage through Smart Choices.” Washington D.C. Spring 2015. Further details. Theory and Practice Roundtable: Fulfilling Rights, Realising Goals and Meeting Duties in the Drive towards Universal Health Coverage, June 25-26, 2015 UCL. Conference on the Ethics of Priority-Setting co-organized by PAHO and the University of Puerto Rico in San Juan, September 16-17. Presentation to the Colombian Ministry of Health in Bogotá, December 1, 2015. Presented to an academic audience in Cali, December 3, 2015. Presented at the Prince Madihol Conference on Priority Setting for Universal Health Coverage, Bangkok, January 2016. Conference on 20 years of the Health Law, Ministry of Health, The Netherlands, March 13, 2016. Launch of the Spanish version of the Report at PAHO, Washington DC, December 1, 2016, with commentary by health-technology assessment leaders from Argentina, Colombia and the Department of Health Economics, World Bank. The Report formed the basis of a question to the European Commission in the European Parliament by Nicola Caputo on January 6, 2015. It has influenced the Norwegian Government’s Report: ‘Open and Fair: Priorities in Health’ (2014). It has also influenced the decision by the Ethiopian Ministry of Health to establish a Center for Medical Ethics and Priority Setting at the College of Health Sciences, Addis Ababa University. Authors of the report have set up a training programme in these areas for teachers of medical ethics and priority setting at Ethiopian universities. Notice of the report on Health Space Asia, June 2014. Notice in Health, Education, Social Protection News & Notes, June 2014.